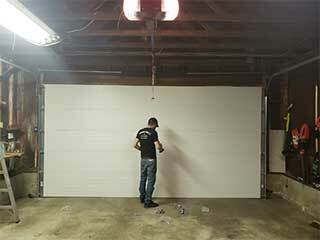 Every part of your garage door exists for a reason. If one component wears out or breaks down, it’s going to cause problems, even if it’s only a small part of the system like the rollers. Little issues can easily develop into much larger ones, and a problem with one component can come to affect other parts. That's why it’s important to not just put up with a door that isn’t working properly. Have our technicians take a look, and we’ll be able to put things right quickly and safely. This is a very common issue. Garage door springs only have a limited lifespan, which can be as short as just a few years, and once they approach the end of their service life they’ll grow noticeably weaker. Worn springs can break, making your door unusable. Repairing or replacing them can be very dangerous, and we strongly recommend contacting our team at the first sign of trouble. Door wobbling and sagging are often signals that your springs need to be swapped out. Remember, this is a very dangerous task and it should be only carried out by professionals. Another key part of the door system that requires regular attention is the rollers. These units need to be kept clean and lubricated in order to move easily. Unfortunately, will become worn over time until they'll eventually need to be replaced. When they become too worn, they won't be able to move as smoothly, or at all, and your door will struggle to open and close, which will place more strain on other parts. Different types of opener units have different drive systems, but whether they use a belt, a screw or a chain to move the door, this crucial part can be a vulnerable weak point. If the drive system is damaged it can cause a major break down, as you probably won't be able to use the opener to open or close the door. Another possible issue involves the internal components, as things like the motor gears and the circuit board can also experience some problems and make your door act up or fail to move at all. Our team at Garage Door Repair Kirkland offers fast emergency repairs, as well as weekend appointments. No matter what problem you’re having we can solve it - get in touch us as soon as you realize something's wrong.